20 Marlborough is located on the south side of Marlborough, between Arlington and Berkeley, with 18 Marlborough to the east and 22 Marlborough to the west. 20 Marlborough was built in 1864-1865, one of two contiguous houses (18-20 Marlborough). Construction began in October of 1864, and the houses were completed in December of 1865. An August 19, 1865, article in the Boston Daily Advertiser reported that “Mr. E. C. Parker has nearly completed two houses, brick with brown-stone trimmings, for John Revere, Esq.” There is no carpenter-builder or mason named E. C. Parker listed in the 1864-1865 City Directories, but he may be Carlton Parker, who was a mason. John Revere was treasurer and later president of the Revere Copper Company. 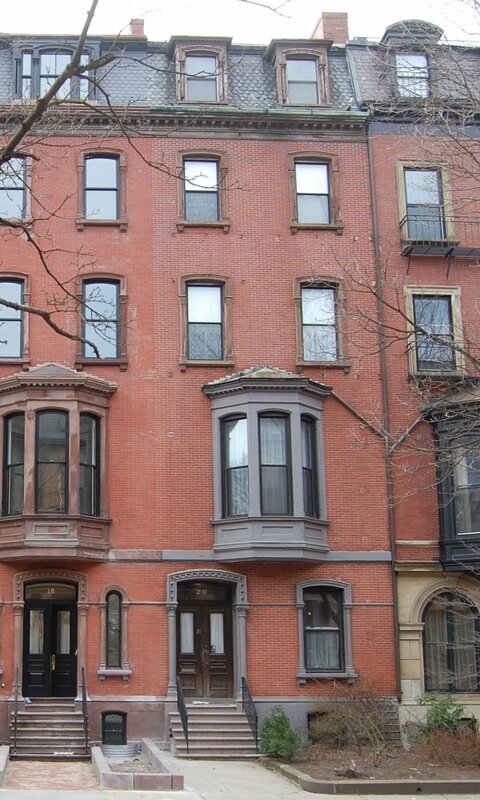 He and his wife, Susan Tilden (Torrey) Revere, lived at 93 Beacon and later at 156 Beacon. 18-20 Marlborough were built for Susan Tilden (Torrey) Revere’s sisters: 18 Marlborough for Ann Duncan Torrey, and 20 Marlborough for Sarah Parker (Torrey) Linzee, the widow of cotton manufacturer Thomas Charles Amory Linzee, who had died in January of 1863. Sarah Linzee purchased the land for 20 Marlborough from Samuel Dalton on May 12, 1864; her sister purchased the land for 18 Marlborough from him on the same day. The lots were part of a larger parcel Samuel Dalton had purchased on March 26, 1863, from Caleb William Loring and Charles F. Choate, trustees for a real estate investment trust formed by them with Francis B. Hayes and Franklin Evans. The parcel sold to Samuel Dalton was part of a larger tract of land with a 287 foot frontage extending west to Berkeley Street that the trust had purchased from the Commonwealth of Massachusetts on May 2, 1860. 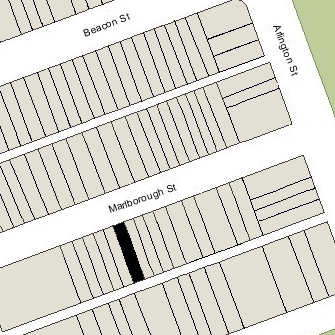 Click here for an index to the deeds for 20 Marlborough. Sarah Linzee lived at 20 Marlborough from the time it was built. Her three children – John Torrey Linzee, Elizabeth Linzee, and Marian Linzee – lived with her. 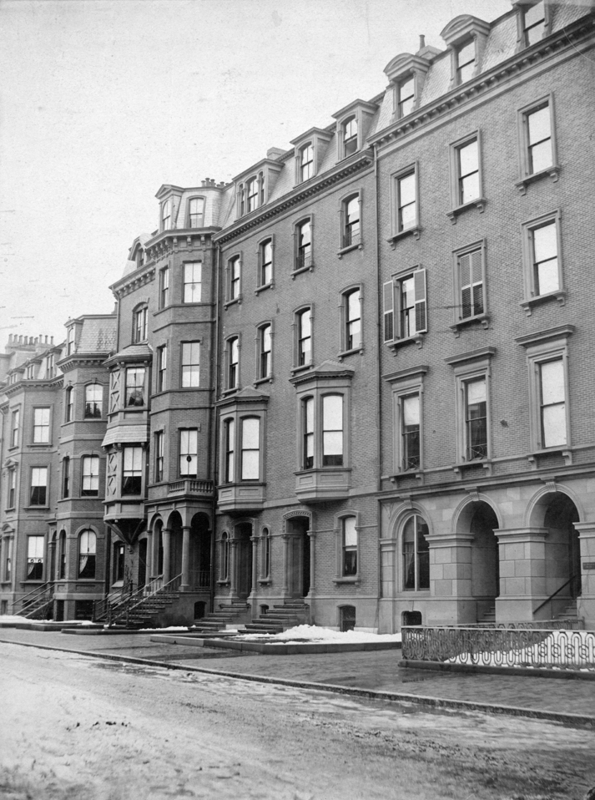 In October of 1866, she and her sister filed suit against John Mixer, who had built 16 Marlborough in a manner which violated the building design restrictions contained in the original deeds from the Commonwealth of Massachusetts. As a result of the litigation, the front façade of 16 Marlborough was rebuilt. During the 1877-1878 and 1879-1879 winter seasons, Sarah Linzee and her daughters traveled to Europe, joined by Ann Torrey (John Torrey Linzee entered Harvard in 1877 and did not join them). During the 1877-1878 season, 20 Marlborough was the home of Miss Alice Mason, and during the 1878-1879 season, it was the home of Mrs. Sarah Augusta (Putnam) Heath, the widow of merchant John Andrew Heath. By 1880, Mrs. Heath had purchased and moved to 348 Marlborough. 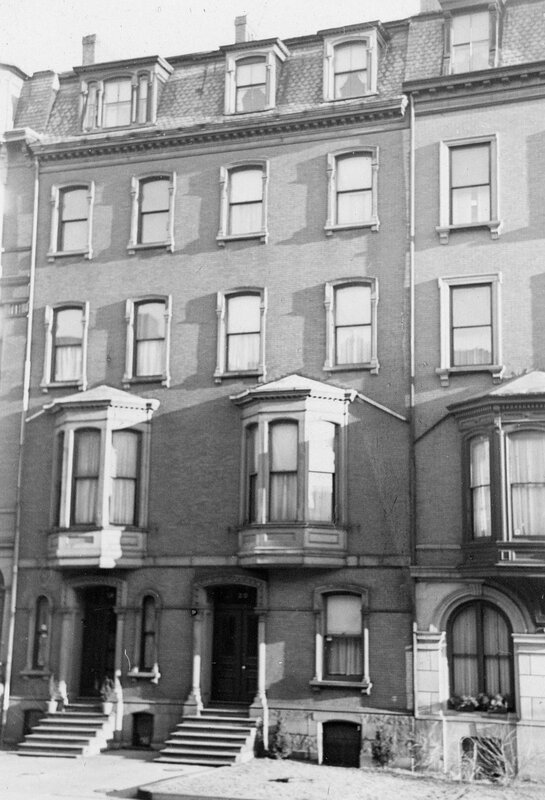 Sarah Linzee, her daughters, and Ann Torrey returned from Europe in September of 1879 and the Linzees resumed living at 20 Marlborough. Marian Linzee married in April of 1889 to Christopher Minot Weld and they moved to the Readville district of Milton. John Torrey Linzee, a banker and broker, married in April of 1891 to Anita Homer Manson and they also moved to Readville. Sarah Linzee died in February 1903. Elizabeth Linzee continued to live at 20 Marlborough, joined by her aunt, Ann Torrey, who moved there from 18 Marlborough. Ann Torrey died in April of 1911 Elizabeth Linzee continued to live at 20 Marlborough until her death in March of 1936. On July 10, 1936, 20 Marlborough was acquired from the Linzee family by real estate dealer Henry J. O’Meara. On September 10, 1936, he transferred it to Thomas Doyle, who conveyed it on the same say to the Granite Realty Corporation. During this period, several permits were filed and abandoned seeking to convert the property into a multiple dwelling. In August of 1936, Wallace R. Marden filed for permission to convert it into six apartments. He subsequently amended his plans to reduce the proposed number of apartments to five, and his permit was approved by the Board of Appeal on September 25, 1936. He did not proceed with the remodeling, however, and in October of 1936, Jenny Karoline (Knudsen) Gegan, the widow of Charles Gegan, filed another permit seeking to convert the property into a six-family apartment building. She also subsequently abandoned the permit (she lived at 226 Huntington and in March of 1937 would acquire and move to 198 Commonwealth, where she operated a lodging house). On October 23, 1936, 20 Marlborough was acquired from the Granite Realty Corporation by Mabel Anne (Cowie) Adams Doyle, the widow of Dr. William Gray Adams, a physician, and the former wife of Henry Lawrence Doyle. She used the surname Adams even though she had been married a second time to Henry Doyle. She previously had lived at 89 Charles and also maintained a home in Belfast, Maine, where Henry Doyle had died in February of 1934). Until about 1927, she had lived at 236 Commonwealth. In May of 1937, Mabel Adams applied for (and subsequently received) permission to convert 20 Marlborough into a lodging house. She continued to live there in 1940, but by 1941 had moved to 16 Commonwealth. On May 1, 1940, 20 Marlborough was acquired from Mabel Adams by Roger Davis Sleeper, a realtor. He and his wife, Dorothy L. (Reynolds) Sleeper, made it their home and operated it as a lodging house. They previously had lived in Brookline. Roger Sleeper died in June of 1944. In his will, he left an undivided half interest in 20 Marlborough to his son, Charles W. Sleeper, by his first marriage, to Vera B. (Daury) Sleeper, and an undivided half interest to his son, Gerald Roger Sleeper, by his marriage to Dorothy (Reynolds) Sleeper. On October 29, 1945, Gerald Sleeper acquired his half-brother’s interest in the property (Charles Sleeper lived in San Francisco; his mother – who had remarried to Harry Cuddy — acted as his representative in the transaction). On September 12, 1949, Gerald Sleeper transferred 20 Marlborough to his mother. Dorothy Sleeper and Gerald Roger Sleeper continued to live at 20 Marlborough (and operate it as a lodging house) until about 1950. On August 31, 1950, 20 Marlborough was acquired from Dorothy L. Sleeper by Francis Hurley, and on September 14, 1950, he conveyed the property to attorney Lawrence W. Sabatino and his wife, Jessica Sabatino. They previously had lived in Lowell. The Sabatinos lived at 20 Marlborough and operated it as a lodging house until about 1954, when they purchased and moved to 103 Beacon. On April 5, 1954, 20 Marlborough was acquired from the Sabatinos by Elizabeth French (Giles) Howard, the widow of John Philip Howard and former wife of Arnold Kargaard, and her daughter, Susan Giles Howard. They lived in Lincoln. Elizabeth Howard was a real estate agent. She continued to operate the property as a lodging house. Susan Howard married in June of 1954 to Donald Douglas Gardner. In February of 1955, Elizabeth Howard filed for (and subsequently received) permission to legalize the occupancy of 20 Marlborough as a lodging house plus an apartment in the basement. On June 24, 1955, 20 Marlborough was acquired from Elizabeth Howard and Susan Gardner by Miss Mary Ann Cullinane. She was a dietician and had lived as a lodger at 20 Marlborough since about 1944. Prior to that, she had lived in Somerville. She continued to operate 20 Marlborough as a lodging house until the mid-1980s. 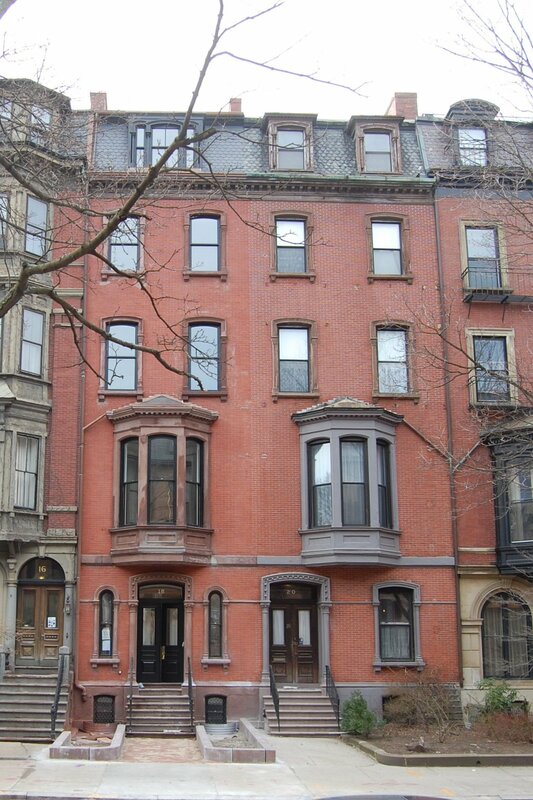 On December 22, 1986, Esther K. Stevens, trustee of the Twenty Marlborough Street Trust, purchased 20 Marlborough. In April of 1987, the Trust filed for (and subsequently received) permission to convert the house from a lodging house to a single-family dwelling with a studio apartment in the rear of the basement level. On February 28, 2014, 20 Marlborough was purchased from David P. Stevens, individually and as trustee of the Twenty Marlborough Street Trust, by the Frazer 20 Marlborough Holdings LP. It filed for (and subsequently received) permission to remodel the property into a single-family dwelling, with a garage replacing the former studio apartment in the rear of the basement. 20 Marlborough subsequently changed hands. It remained a single-family dwelling in 2015.